Automated patch management software for Microsoft servers, workstations, and third-party applications. Automate patching and reporting and save time by simplifying patch management on servers and workstations. Decrease security risks and limit service interruptions by helping to ensure that patches get applied, and controlling what gets patched and when. Keep your desktops, laptops, servers, and VMs patched and secure with the latest patches for 3rd-party applications. Stay on top of vulnerabilities and produce summary reports to show patching status. WSUS is an excellent tool, but it lacks the ability to effectively schedule patches and report on patch status and inventory. 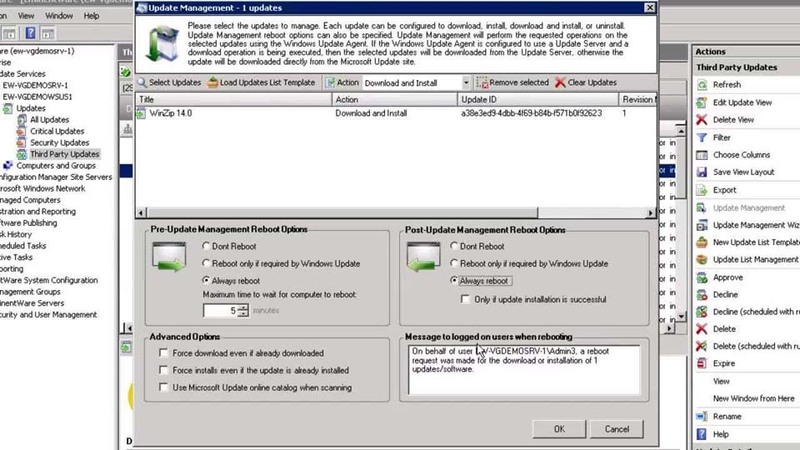 Manage patches for your Microsoft products, and diagnose and fix problems from the Windows Update Agent with SolarWinds patching software. Despite using SCCM, when it comes to patch management and software distribution of non-Microsoft updates, things can get complicated. View details for a variety of 3rd-party software patches and the status of endpoints managed by SCCM. The time between the discovery of an operating system or application vulnerability and the emergence of an exploit is decreasing. Discover patch statuses and vulnerabilities of all Microsoft and other 3rd-party applications. Researching, scripting, packaging, and testing patches for 3rd-party applications requires time and resources you simply don’t have. Use 3rd-party app packages, including Java™, that are already built and tested by SolarWinds. With everything else on your plate, it can be hard to strike a balance between tracking patch status and applying new ones. Determine the status of patches and demonstrate patch compliance to auditors and internal stakeholders. Tracking who got patched, with what, and what still needs to be patched is hard enough, especially with new patches mounting. You can view the latest available patches, top 10 missing patches, and the general health of your environment using SolarWinds patch software. Features Overview Automated patch management software for Microsoft servers, workstations, and third-party applications. Patch Manager is an industry favorite. Hands down. Where can I find information on installation and customization for my Patch Manager product? Does SolarWinds offer training or certification for the Patch Manager product? Our New to Patch Manager section was created using customer feedback and contains videos, guides, and articles that will help you be more successful with your installation and customization. SolarWinds offers an onboarding assistance program called Smart Start if you are looking for help getting Patch Manager set up and optimized. We will provide you with access to one of our implementation experts who will work with you to understand your goals, assist you in installing and configuring your product, and help you optimize your environment for how you need your business to run. Software patching involves the acquisition, testing, and installing of code - known as a patch - into an executable program to provide an update, fix, or improved version of the program or its supporting data. Although software patching is critical for IT security, IT administrators that manage this process can spend an exorbitant amount of time manually applying and tracking patches across an entire IT infrastructure. Many choose, instead, to leverage patch management software to automate this process, not only for software patching, but to patch servers and workstations as well. Security patches released for Microsoft or third-party software, including Java patches, are important updates that need to be rolled out quickly to a select group of servers or workstations. Failed updates commonly occur when packages are not installed properly, leaving computers vulnerable to security threats. SolarWinds patch management software helps you proactively address known software vulnerabilities and security patch management, saving you weeks of time- and labor-intensive work. Patch Manager notifies you of all updates via email and the console window, and extends your existing Microsoft Windows Server Update Service (WSUS) or System Center Configuration Manager (SCCM) environment to publish third-party updates as well. To simplify the patch process, the patch management software updates are categorized as security, critical, definition, third-party, and service pack updates. You can select the specific Microsoft or third-party update, approve it, and schedule or deploy the update to the select computer group or Active Directory organizational unit (OU). SolarWinds Patch Manager gives you control over the patch process by automating approval processes, shutdowns, reboots, defining the correct pre- and post-installation environment, and creating comprehensive reports. For example, after rolling out a critical security update, you can quickly run a Percent Failed or Percent Not Installed report to assess the patch status. This enables you to take swift and appropriate action to deal with any failed updates. Security patch management in your WSUS/SCCM environment can become more effective and less time-consuming and error-prone with Patch Manager.